All of my boards are just a bit over 1/4 inch, probably 5/16 , as are most of the BC trappers. The newer boards I have made are a bit thicker and tapered to the nose. We use a belly wedge that is 3/4" at the base and tapered to the nose. If anything you will gain size with a thin board, to your advantage. Once the pelt comes off the board and is drummed it would be doubtful if anyone could tell what thickness board you used. 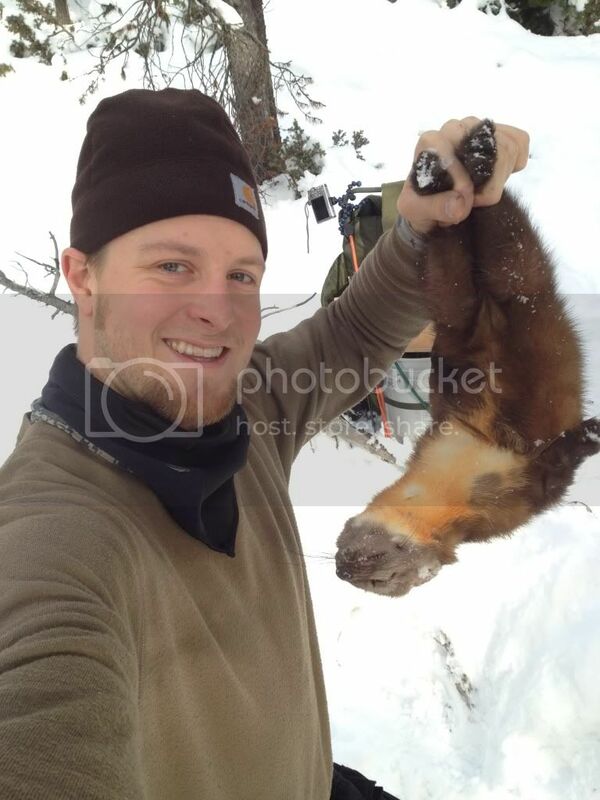 Just got done pelting a marten, one of the few on my line again this season. I will take pictures of the different ways for handling the tails and feet so we are all on the same page. Yeah he will have lots of pin holes when done boarding him several times. Ron is correct, we have both talked to quite a number of instructors, graders, and others involved in the fur auctions. I had some very interesting conversations with personnel from both NAFA, and FH. While I got the impression that they would prefer to see tails spread, their bottom line is that it will not make any difference in price as long as the tail is dry. I then asked the question of what would happen with a marten pelt with no tail, as long as there was no other damage. ( I have had marten with no tails graded damaged before) Common sense would say that if the tails are not graded it should not matter at all in final price. I was then told by a fellow from NAFA, that a marten tail has a value of about $10. I found that fact very interesting. That means on a $100 marten, 10% of the value is in the tail..... yet they dont grade them. He went on to say that buyers count on those tails, and it would be bad if trappers started chopping off the tails. The answer that made the most sense to me came from a fellow at Fur Harvesters. 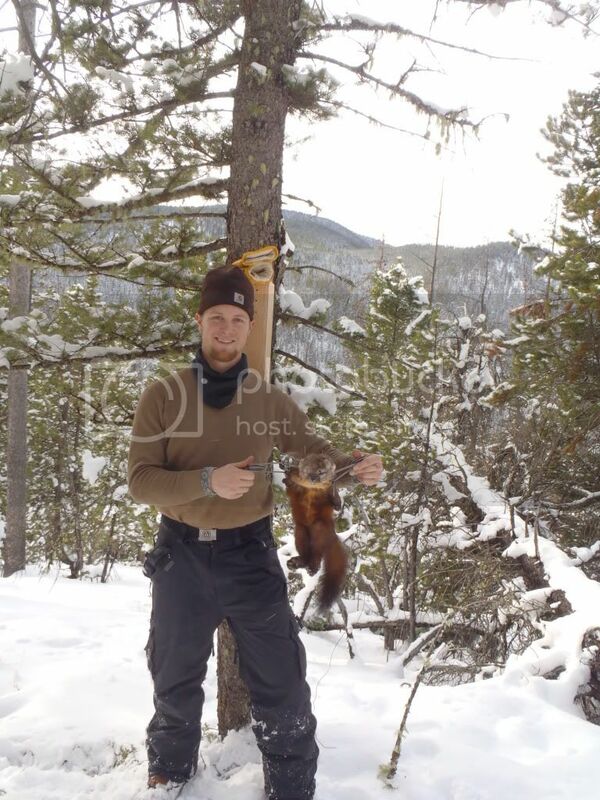 He said a grader will spend just seconds on each pelt, and when a marten pelt is between sizes, the pelt that has been handled very well has a far greater chance of going up a size than one that is just average. He went on to say that good fur handling always pays. My personnel conclusion is that I will continue to spread the tails, and ship to FH. Is that why you use crayons ? You bet ! Much cheaper ! Ron, the weasel I refer to was sent with a couple dozen taken 3-4 years ago, short-tails. that was the year weasel went very high. I think I averaged $6.80, with a couple nearing $9.00. I had one graded dmgd. that brought .75, and as such assumed it was the one, (the only one), that didn't have a tail. Perhaps the reason the prices where so high that year was to fill a special order? From my experience with the ermine grading I'm going to say that it was not that one. My best guess. not seeing the all of the ermine is that there was one with a taint or shedding fur. Damaged can also be one that still had some brown, that shows on the leather, one with a hole that was sewn up. bite marks from another ermine, mice or birds, or a tear after drying. Again only suggestions. If there are ermine without tails and they do go into another lot, everything else being equal, they should bring more than 75 cents. Wondering if you leave the fur in only to get skin dry to the touch, then turn it fur out for stretching?? I'm a complete rookie at this and don't want to ruin my furs when/if I get any. I can't really get a solid answer from the local fur buyer. Wondering if you leave the fur in only to get skin dry to the touch, then turn it fur out for stretching?? Yes and it only takes few hours if you have good air circulation. If it gets to dry just wrap in a damp towel for 10 - 15 minutes to soften it up and then turn. It will dry fine after this damping treatment. Thanks for the info. Is it safe to dry them in an uninsulated outdoor shed with no heat?? I could turn a small milk crate heater on. Probably would dry but why mess with it. Dry them in the house, next to no bad odor off marten. Brent you may already know this but if you didn't this may help. When you catch marten in a bodygrip trap, don't take the trap off of a frozen critter, take an extra trap and swap them out. A lot of rookies ruin fur trying to take the trap off a frozen marten. If it's cold enough in the shed it actually works bette for me. I put them out in my arctic entry in say 15 degrees and they are ready to turn in about 24 hours. If you forget and go 48 hours they can still be turned. I've tried it both ways and I like the flexibility of being able to do it the next day since I'm usually skinning late at night after everyone goes to bed. DT7- I have read that and planned on doing that. Thanks for the heads up though. Its amazing how delicate the fur is on them. When you catch marten in a bodygrip trap, don't take the trap off of a frozen critter, take an extra trap and swap them out. What are the thoughts on freeze drying? And does anyone have a good description of exactly what it is? I got my first marty yesterday! He is still frozen solid hanging in the shed, head down. I don't want to thaw him until I know exactly hot i'm going to dry him. Lots of orange on that one! I've used the freeze dry method on beaver before, but only because they can be really greasy and I was out of sawdust. You need pretty cold temps for it to work. You shouldn't need to use that method on marten, though. They are very thin-skinned, lean, and dry quickly. Anyone have input on board size for a small female (young of year)??? A grader at FH told me to use the same board for all marten? ?